Krill swarm. Photographer: Jamie Hall. Image source: NOAA. via Wikimedia Commons. Antarctic krill are usually less than 6 cm in length but their size belies the major role they play in sustaining much of the life in the Southern Ocean. They are the primary food source for many species of whales, seals, penguins and fish. Using statistical models, a team of researchers from the British Antarctic Survey and Plymouth Marine Laboratory assessed the likely impact of projected temperature increases on the Weddell Sea, Scotia Sea and Southern Drake Passage, which is known for its abundance of krill. This region has experienced sea surface warming of as much as 1°C over fifty years. Projections suggest this could rise by another 1°C by the end of the 21st century. The adults require suitable temperatures and enough of the right type of food (larger phytoplankton) to successfully grow and reproduce. Many of these critical environmental features (temperature, acidity, sea ice and food availability) could be affected by climate change. The projected effects of warming are not evenly spread. The island of South Georgia is located within the area likely to be worst affected. 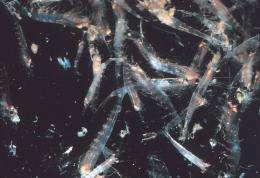 Here the reduction in krill habitat could be as much as 55%. The island is home to a range of animals such as fur seals and macaroni penguins that depend upon krill, and others, such as black-browed albatrosses, which eat substantial amounts of krill as well as fish and squid. The researchers say animals which don't travel far to forage, such as fur seals, would be most affected by the projected changes. Krill is also being commercially fished, although there is nothing to suggest current levels are unsustainable. In fact, at less than 1% of estimated biomass, catches are much lower than most other commercial fisheries. But the Antarctic krill fishery took 68% of its total catch between 1980 and 2011 from the area of projected habitat degradation. The scientists suggest improved management systems to ensure the fisheries take into account both growing demand for catches and climate change. "Each year, growth of Antarctic krill in the Southern Ocean produces new material that weighs twice as much as all the sugar produced in the world. Krill grow fastest in cold water and any warming can slow down or stop growth, reducing the food available for wildlife. Our research suggests that expected warming this century could severely reduce the area in which krill can successfully grow." Although there is evidence that warming seas pose a threat to Antarctic krill habitats the team of researchers believe this can be mitigated with effective fisheries management systems in place. More information: "Potential Climate Change Effects on the Habitat of Antarctic Krill in the Weddell Quadrant of the Southern Ocean" by Simeon Hill, Tony Phillips (BAS) and Angus Atkinson (PML) is published by PLOS ONE. For 500 million years, a warm Earth has been a fecund Earth. There is no reason to believe this time will be any different (assuming we are not leaving the interglacial and getting ready to ice up, again). Regardless: "The polar bears will be fine". - Freeman Dyson. Activists auto-downrate my every comment. "The island of South Georgia is located within the area likely to be worst affected." Sudden change geologically speaking is associated with mass extinctions. I doubt many large mammals and specialists will be fine. Rats and cockroaches are pretty much what we'll be left with. Fecund rats and roaches, eventually. After a few million years. How does the pig/ape hybrid fare? He expends great effort to overcome his lack of fecundity. So the water is warming, yet the ice is increasing? How does that work? Is it some sort of magical ice that only occurs in warm sea water? Gmr: If Global Warming suddenly kicked in it would take about five years to modify enough coal plant scrubbers to dim the sun for a century with sulfur compounds as the nuclear plants that Greenpeace and friends blocked are finally built. If we spend money on premature solar technology and silly windmills that destroy the countryside, basic science R&D will continue to suffer and breakthroughs that actually win real hard science Nobel prizes will not be there to help us use less energy and know how to fix environmental issues. Volcanism has nothing to do with it - the Antarctic peninsula lies in the zone of westerlies and has warmed because of that. does not show "mild but steady cooling"
LOL. You really don't know much about sea ice, do you? You need to read up a little more on sea ice, and how it forms.